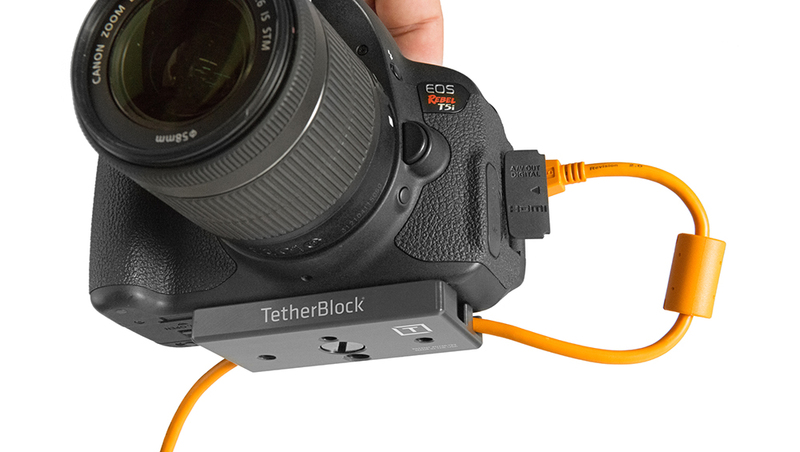 The TetherBlock® locks your tethered cable into place, keeping your cable or cord plugged in and your camera’s sensitive data port protected from damage. If you have a Arca-style ball head, we recommend the TetherBlock Arca. From there, either shoot handheld or attach the TetherBlock to your camera’s tripod mount and you’ll be able to shoot tethered to a computer without fear of your tethered cable becoming unplugged. The bottom of the TetherBlock features both a 1/4″-20 and a 3/8″ female tripod thread, allowing it to be mounted directly onto a tripod plate or head. If you are mating it with your tripod plate, you will be able to center your plate on the TetherBlock giving you a secure connection. Fits tripod mount via either a 1/4″-20 (for the tripod plate) or 3/8″ thread mount directly on tripod. One (1) TetherBlock in Graphite.